Baby furniture was originally created with the infant's safety in mind. Typically baby furniture includes cribs, bassinets, or cradles, as well as, changing tables, high chairs, playpens, baby walkers, and toy chests to match any tastes and budget. See our collection baby furniture brands like Bassett® Furniture, Ikea Furnishing, Stork Craft , and more... Click below to see our whole selection of baby furniture brands! 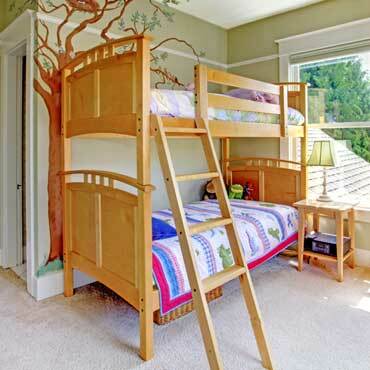 There is a wide variety of kids' bedroom furniture so you can create an atmosphere that is comfortable and expresses your child's personality. Select from individual pieces or completes sets including matching dressers, beds and side tables. See our collection children's furniture brands like Ikea Furnishing, Stork Craft , and more... Click below to see our whole selection of children's furniture brands! At DesignBiz, we want to make sure you find the finest home furnishings when you browse online. You have searched for baby and kids furniture and this page displays all the info, brands, articles, and videos that we have for baby and kids furniture. With hundreds of manufacturers and brands to choose from, we want to help you find the perfect solution for your style preferences. Browse through our selection of brands, like Ashley Furniture, and more. If you aren’t finding the brand of baby and kids furniture you are currently searching for, can try our sponsored links below.